and become God-like through God’s grace." "The incarnation of God the Word found fertile ground in man’s proclivity to beauty, to goodness, to truth and to the eternal. Orthodoxy has not functioned as some religion or sect. It was not the movement of the human spirit towards God but the revelation of the true God, Jesus Christ, to man. A basic precept of Orthodoxy is that of the person ­– the personhood of God and of man. God is a Trinity of persons – persons with a common essence but distinct and unique characteristics. Man, who is in the image of God, is distinct and unique as a person. Consequently, Orthodoxy does not marginalize man. It hopes for true unity and worldwide brotherhood for the human race and offers to provide it. It has not consumed ethnic groups; it has not clumped everyone into one mass; rather it contributes to the preservation of the particular cultural identity of every ethnic group." "Orthodox Christianity and the World (Pravmir.com) is the English-language sister site of Православие и Мир (Pravmir.ru), the most visited Orthodox Christian website in Russia today. Its mission is to provide daily high-quality articles in English on how to be an Orthodox Christian in today’s world." A website that collects Orthodox articles and news stories from around the world. Archives of an excellent (though now inactive) blog by an anonymous Orthodox clergyman. 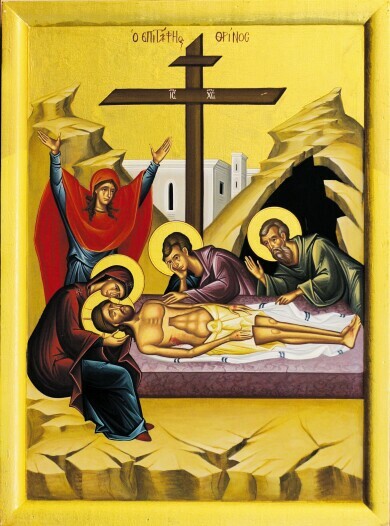 The miracle of the Holy Fire that appears at the tomb of Jesus Christ each year on Great and Holy Saturday. On Christian faith and life, on Holy Scriptures, on prayer and sacraments, on the life of saints, on theology, and selected writings from the holy fathers. Flip through the dogmatically-correct, lavishly-illustrated Potamitis children’s books and have fun at the Orthodox Kids Corner; download (private use only) coloring pages which complement the books. "The Orthodox Arts Journal publishes articles and news for the promotion of traditional Orthodox liturgical arts. The Journal covers visual arts, music, liturgical ceremony and texts, and relevant art history and theory. The Journal presents these topics together to highlight the unified witness of the arts to the beauty of the Kingdom of God and to promulgate an understanding of how the arts work together in the worship of the Church." The extraordinary web diary of Father Stephen Freeman. Media ministries of the Antiochian Orthodox Christian Archdiocese of North America. Information about making bread for the Divine Liturgy. Links to hundreds of Orthodox-related websites. "This is a journal of my experience as an Orthodox Christian with an emphasis on my inner struggle, in particular; the search for the 'heart' and its purification, which is the way to God and our participation in His Uncreated Energy. It includes photos and stories of my travels to Greece, Serbia, Israel, and England." "Adopted at the Sacred Bishops’ Council of the Russian Orthodox Church, this document sets forth the basic provisions of her teaching on church-state relations and a number of problems socially significant today. It also reflects the official position of Moscow Patriarchate on relations with state and secular society. In addition, it gives a number of guidelines to be applied in this field by the episcopate, clergy and laity." Though produced by the Church of Russia to address its particular circumstances and challenges, this document reflects deeply and faithfully on topics that all Orthodox Christians encounter in the contemporary world.